Last week, Madonna posted a “Je Suis Charlie” image on Instagram to offer support after 12 people were killed in the gun attack on French satirical magazine Charlie Hebdo’s Paris offices. She received a huge backlash from the media, because the Instagram description included the #RebelHearts hasthag. Madonna was accused of using the recent terrorist attack in Paris to promote her album Rebel Heart. 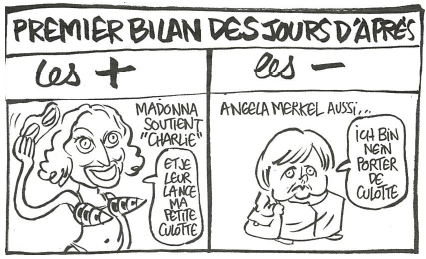 Today, Charlie Hebdo proved them wrong and acknowledged Madonna’s support. They released their first issue after the horrible assault, which sold out today in France, and included a list of positive and negative things that occured the days after the attack.